Ray Ban: a legacy of authenticity. From our history as the official sunglass of the US Army fighter pilots to becoming the most iconic sunglasses in the world, more than seventy years after introducing the first pair of Anti-Glare Sunglasses to the world’s top pilots, Ray-Ban continues its mission of pioneering innovative eyewear with Ray-Ban sunglasses and frames. Designed with the newest technology these models feature P3 PLUS and P3 lenses, providing a top notch polarized lens with high color definition and enhancement, our Anti-reflective coatings eliminate distracting glare and Ray Ban lenses protect your eyes from the damaging UV rays of UV light. 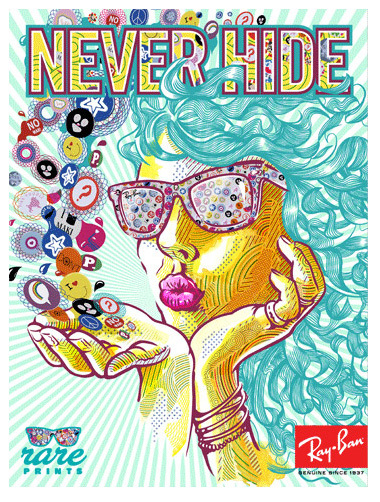 Ray Ban never hide! Ray Ban and Parrelli Optical®, partners in innovation.